An old man putting his insanity on display. Brother Jed is batshit crazy. There’s no doubt about it. A man who has spent 38 years of his life traveling the country in order to tell college students that they are doomed to an eternity in Hell lest they accept Jesus as their lord and savior is certifiably bonkers. I have my suspicions that as he fades into old age his condition has grown worse, but I can’t confirm that. 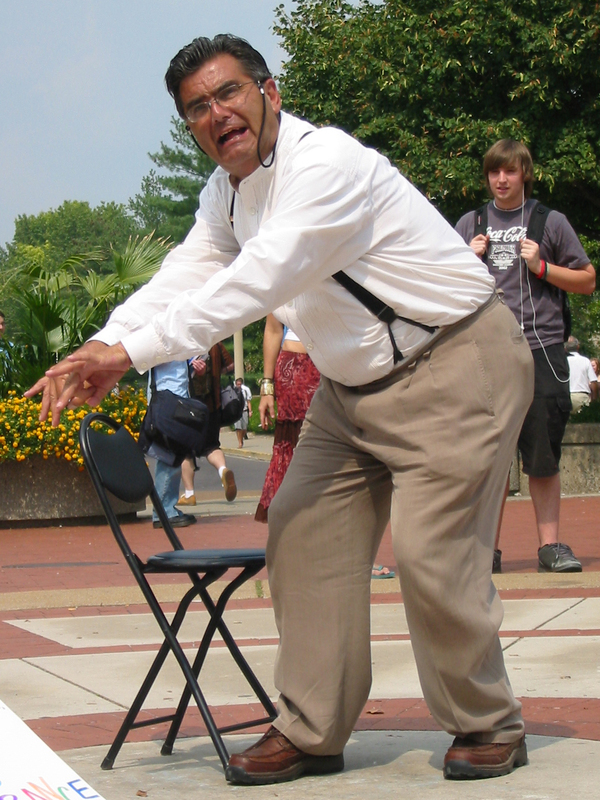 When Brother Jed made an appearance at a local university, the resident skeptic organization politely invited him to speak to their group. I attended the meeting and listened to what Jed had to say. There was plenty of the anticipated petulant condemnations, but Brother Jed did have some personal insight that I did not expect. Describing his experiences on various campuses, he recalled a time when a nonbeliever had come to his defense amid the onslaught of chastisement from Christian college students. The secular student argued that despite his disagreements with Brother Jed, he did not doubt that Jed was sincere in his lunacy. The student continued that he was skeptical of the sincerity of the “Christian” students berating Brother Jed – for if they truly believed what they claimed, they would be doing the exact same as Jed. I have come to the same conclusion. During my extensive interaction with the religious, it is quite clear that the ones who dedicate their lives to their faith are the ones who are most convicted in their belief. It is a point that has also been made by Sam Harris: he has said often that indeed the most fervent believers on September 11, 2001 were the hijackers. It is then here that a clear line must be drawn – between the fervent believers and the ruthless opportunists. Fundamentalists – henceforth deemed “sincere believers” – range in the amount of threat they pose to civil, peaceful living. On one end of the spectrum you have Brother Jed, whose lunatic rantings are essentially harmless. In fact, people like Brother Jed and others of the mentally-ill evangelical variety probably do a great deal of good for the secular community. (When a psychotic slimeball vomits putrid messages of intolerance and hostility upon passerby on college campuses, the group that stands up and tells students to be themselves seems quite welcoming.) On the other end, there are the violent faithful – the jihadists and abortion clinic bombers – who have no reservations about harming others to advance their beliefs. Opportunists, on the other hand, are almost universally harmful, some more than others. The level of conviction among this vile segment of the religious community is often unclear. In this category I place such groups as the Westboro Baptist Church, the Family Research Council, and the Catholic Church. The goal of these groups is completely self-serving (whereas the sincere believers are genuinely concerned with continuing what they believe to be a God-ordained mission). The opportunists seek money, power, recognition. Those desires are not in and of themselves harmful, but opportunistic religious groups rarely seek means to their ends that don’t lay to waste certain segments of the population on the way. In the case of Westboro, it’s American soldiers. For the Family Research Council, it’s homosexuals. The Catholic Church’s primary victims may be its very adherents! The point I am trying to make is not that the attention of the nonreligious community should be focused more on one group or the other – sincere believers and opportunists both present the potential for tangible harm to others. Rather, I think that it is important to make the distinction because the approach to be made in defeating these groups is necessarily different. In the case of the believers, one must argue with the intention of dismantling the belief. Because this group is so committed to what they believe, the only thing that can shake them from continuing their wretched crusades is to crumble the foundation upon which they stand. By no means is this an easy task. Such deeply held beliefs are difficult to shake; and in cases such as Brother Jed, it may indeed be too late to teach an old dog new tricks. There are, however, some who are not beyond hope – and I don’t believe our efforts are wasted in discussion with them. Tactics to dismantle the opportunists may not be based in arguments against their belief. After all, it is difficult sometimes to understand specifically what their beliefs are, and they are unlikely to be affected by reasonable arguments against such beliefs. There’s a reason that the Family Research Council doesn’t care about current scientific understanding of homosexuality and that the Catholic Church maintains antiquated beliefs about contraceptives and abortion. To abandon such premises would be to forfeit their positions of power, so they are not interested in updating their principles. Instead, the plan of attack against these groups must be legal. Keep the sickness of Catholicism from influencing health care law. Thrash and shred attempts by anti-gay groups to legalize “gay therapy.” By all means continue to expose their nonsense for what it is for the benefit of onlookers, but understand that truly defeating these forces of evil cannot be accomplished by debate alone.